I gasp in horror as my three-year-old absent-mindedly lodges his finger up his nostril and digs around for buried treasure. I reach for the tissue but it’s too late: he has already licked the found treasure off his fingertip. If this had been a one-time thing, it wouldn’t have phased me. After all, kids can be gross and they should be allowed some leeway once in a while. But multiply this behaviour by two kids (I have a two-year-old as well), and you’ve got a horror flick on your hands – literally. For every parent who has watched their preschooler (or other preschoolers) pick their nose (and eat it), take heart. It’s very common, according to Liza Finlay, a psychotherapist who works at Leaside Therapy Centre in Toronto. In other words, nose picking in itself isn’t necessarily a bad behaviour; it’s doing it in public that’s socially offensive. “We need to teach them the rules of engagement and that their behaviours need to respect the rights of others,” says Liza. “Nose picking isn’t a misbehaviour; it’s just not nice to do it in front of a group of others.” In a world where viruses are spread by bodily fluid and such, it’s especially important to teach kids about germs, healthy behaviour and the importance of washing their hands. 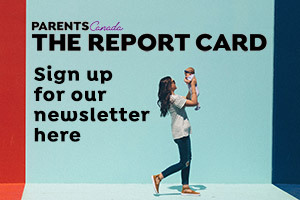 Even if parents do nothing to curb nose picking, eventually peers will come to play a greater role in reinforcing socially acceptable behaviour. “We all seek to belong. It’s a primal drive. It matters what peers say because we want to fit in with them,” says Liza. This process of social schooling starts in junior kindergarten but doesn’t really become important until Grade 1 or 2. 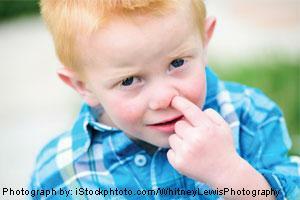 All it could take is one “Ewww!” from a classmate before kids learn to pick their noses in private. Reframe. Nose picking isn’t bad, but doing it in front of people is inappropriate. Don’t treat it as a bad thing. The last thing you want to do in this case is overreact, Liza says. “The greater your reaction, the greater the pay-off for your child. If you make a fuss, they will do it more. They like the reaction and attention.” Also, making your child feel badly can pave the way for a power struggle.